6th Annual Michigan Inventors Expo by Michigan Inventors Coalition. Join the Michigan Inventors Coalition on Thursday, September 6th at the Kellogg Conference Center in Lansing, MI for our 6th Annual Michigan Inventors Expo! Come showcase your product and network with fellow inventors & business professionals. Booth space is limited to 50 this year, so be sure to sign up early. We look forward to seeing you there! U.S. Pat. No. 5,329,672: Metal wire paper clip structure. 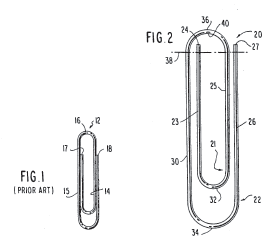 JW Note: The paper clip – patented in 1994. Many thanks to Michael Barclay at WSGR for bringing this one (and many others) to our attention! In a petition filed under the Administrative Procedures Act, they remind new USPTO Director Andrei Iancu of the 2006 Supreme Court decision in Ebay which eliminated the right to injunctive relief for patent holding inventors. This error was further highlighted by the recent Supreme Court decision Oil States which held that patents are not property rights with the right to exclude, but are instead “public franchise rights” like the right to erect a toll bridge, which can be given or taken at the pleasure of the federal agency, without a judge or jury. The petition goes on to ask the Director to correct the wording so that inventors are no longer misled into believing that their U.S. patent provides an exclusive right to their invention. The petition is also signed by Gary Stecklein (Inventor and President of Inventor’s Association of South Central Kansas), Stephen Lyon (Inventor and President of Inventor’s Network of Minnesota), Adrian Pelkus (Inventor and President of San Diego Inventors Forum), Tom Woolston (Inventor from Virginia and CEO of MercExchange), Joachim Martillo (Inventor and Patent Agent from Massachusetts), Josh Malone (Inventor from Texas), and Paul Morinville (Inventor from Indiana). 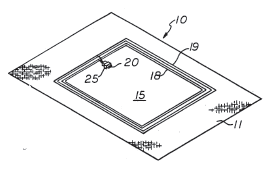 The petition is posted at http://www.usinventor.org/wp-content/uploads/2018/06/Patent-Text-Correction-Rulemaking-Petition.pdf. 1. A laser detection and ranging (LADAR) system, comprising: a two-dimensional array of detector elements, each detector element within the array including: a photosensitive region configured to receive return light reflected from a target and oscillating local light from a local light source, and local processing circuitry coupled to an output of the respective photosensitive region and configured to receive an analog signal on the output and to sample the analog signal a plurality of times during each sample period clock cycle to obtain a plurality of components for a sample during each sample period clock cycle; a data bus coupled to one or more outputs of each of the detector elements and configured to receive the plurality of sample components from each of the detector elements for each sample period clock cycle; and a processor coupled to the data bus and configured to receive, from the data bus, the plurality of sample components from each of the detector elements for each sample period clock cycle and to determine an amplitude and a phase for an interfering frequency corresponding to interference between the return light and the oscillating local light using the plurality of sample components. As we rapidly approach the issuance of U.S. Patent No. 10,000,000, the USPTO is taking full advantage of the opportunity educate the public about the history and importance of patents to the United States, and to generate excitement about the U.S. patent system in general. Check out this new website: https://10millionpatents.uspto.gov/, and the associated video show below! U.S. Pat. No. 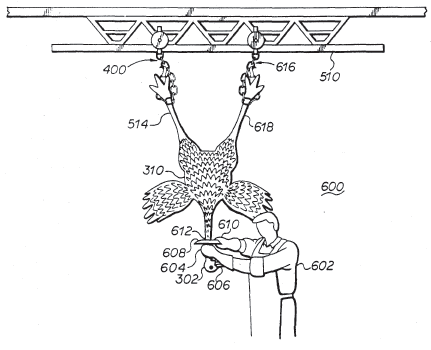 5,246,396: Method for the humane slaughter and processing of domesticated ostrich.